F. Barish-Stern was an actress for years, but when her children preferred video games to reading, she turned her love of stories from performing to creating. Her first novel, “Code 47 to BREV Force,” was written on the train from New York to Disneyworld, and was originally 75 pages. She used her sons love of superheroes as a theme, but never went any further…until recently when she was encouraged by the increased love of superheroes, to bring it out from the bottom drawer. So, she tuned 75 pages into the BREV Force trilogy; of over 750 pages. Over the years, writing for newspapers and magazines led her to helping other writers and she used those experiences to create, “HOW TO WRITE YOUR BOOK, From an Idea…To Your Published Story,” a step by step book, narrated by 3 cartoon type guides: the writer, editor and publisher, who can help anyone write their story. She used how she wrote BREV Force as examples to show that anyone can write a book following these tips. Do you want to write a book and get it published but do not know how to go about it? How To Write Your Book: From an Idea to Your Published Story by Bobbi Madry and Francine Barish-Stern is an insightful and useful guide that will assist any writer through the process of preparing them to write, helping them to get their good ideas down on paper, and walking them through revising and editing. Writing is hard work and the tips and tools in this book will make writers look at writing as embarking on an adventure and sticking with it until they reach their destination. The strategies, writing tools, and information in this book are useful to anyone who wants to write. The approach to this relevant topic is different and the writing experiences of the authors make their suggestions credible and plausible to readers. The writing is interactive and the formatting is even more entertaining. 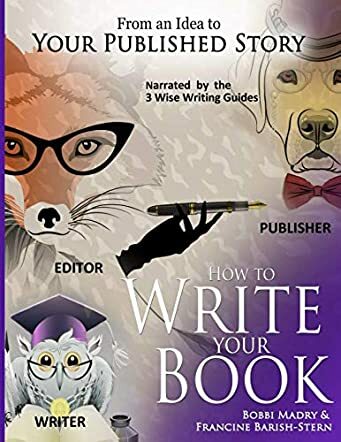 The illustrations, quiz, exercises, and personal evaluation chart make it an interactive book and makes it easy for writers to plan their basic working outline and then get their ideas written down into a finished story. I recommend this book to all readers who love putting down their thoughts, who want to enhance their writing skills, and need to get their priorities right when it comes to writing and getting their work published. Great book to help you write a story! My daughter wrote her first fiction book with the help of this book. !